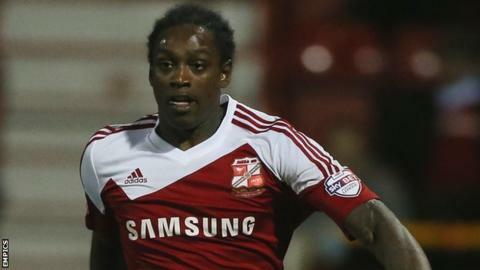 Swindon Town have terminated the contract of striker Nile Ranger by mutual consent. The former Newcastle United forward, 23, has been at the club since August. He had been arrested on 13 April after a door and lift were damaged at flats in Swindon, but on Tuesday Ranger pleaded not guilty to criminal damage. Ranger was invited to a disciplinary hearing by League One side Swindon on Thursday, before an agreement was made to terminate his contract. A statement from the club said: "Following on from Thursday's disciplinary meeting with Nile Ranger and his PFA representative, Swindon Town can confirm that both the club and Nile Ranger have mutually agreed to a termination of Nile's contract with immediate effect." He had scored 10 goals in 28 appearances for Swindon. Ranger, born in London, spent time in the youth set-ups at Crystal Palace and Southampton before joining Newcastle. He made his senior debut in 2009-10 season and went on to play 62 games for the Magpies. He left Newcastle by mutual consent in March 2013 and, after a spell without a club, joined Swindon as a free agent on a one-year deal with the option of a further year. Ranger is set to finish as Town's top scorer this season but his stay was not without controversy off the field. In November, he failed to report to training and manager Mark Cooper admitted he was unsure of the player's whereabouts. Cooper then refused to play Ranger until he showed an improved attitude, and suggested he could be offloaded because of his disciplinary record. However, Ranger returned to the squad at the turn of the year after apologising to his team-mates. The striker suffered a serious hamstring tear in the game against Colchester on 14 February, which was to be his final appearance for the club.